Consider what those of us can see in the night sky with healthy eyes, without any tools, far from city lights. Away from the dazzle of Sun’s day the Moon at night is, of course, the brightest above all. The visible stars make an obvious and fixed, so it seems, pattern that fills the celestial hemisphere. They swell in number where they sweep into the broad sky river of the Milky Way. If we return night after night, we see that there are five wanderers besides the Sun and the Moon against the stellar background: Mercury, Venus, Mars, Jupiter, and Saturn. The sky sometimes flares with something different—stars that abruptly brighten then fade, comets and their tails and omens, or meteors that streak—but the catalog of its permanent objects visible to human eyes was complete and static for thousands of years of human civilization. Longer if we count the unrecorded millennia of modern humans who must have held a catalog in mind anyway. Nearly 200,000 years of modern human history changed forever on the nights of January 7 and 8, 1610 when Galileo Galilei pointed an early telescope at Jupiter and saw that it had four moons. Their detection lit the way to a refined understanding of the universe and how it is organized. Over the coming centuries, observers with increasingly powerful telescopes added Uranus (March 13, 1781) and Neptune (September 23, 1846) to the list of planets, detected moons around other planets, and discovered a new class of celestial objects they called asteroids. 400 years of the telescope and all its discoveries represents just 0.2% of the 200,000 years of modern human history. The Sun, the Moon, and first five known planets are easy to spot even with the human eye because they are so bright, so close, and move rapidly compared to celestial background. Even when telescopes and cameras became more powerful, objects in our solar system that were smaller, dimmer, and/or much further away remained elusive because of the way they compete for recognition with all the other objects in the field of view. 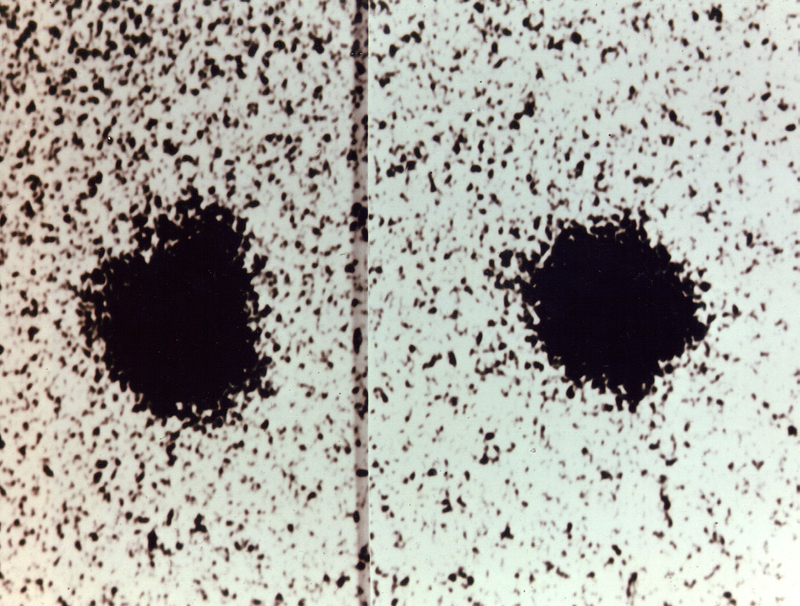 It took the patience and dedication of Clyde Tombaugh at Lowell Observatory in Flagstaff, Arizona to discover a single tiny dot that moved against the background of stars in a pair of photographs taken on January 23 and 29, 1930. He blinked back and forth between the two photographs using a blink comparator and on February 18, 1930 he saw the object. 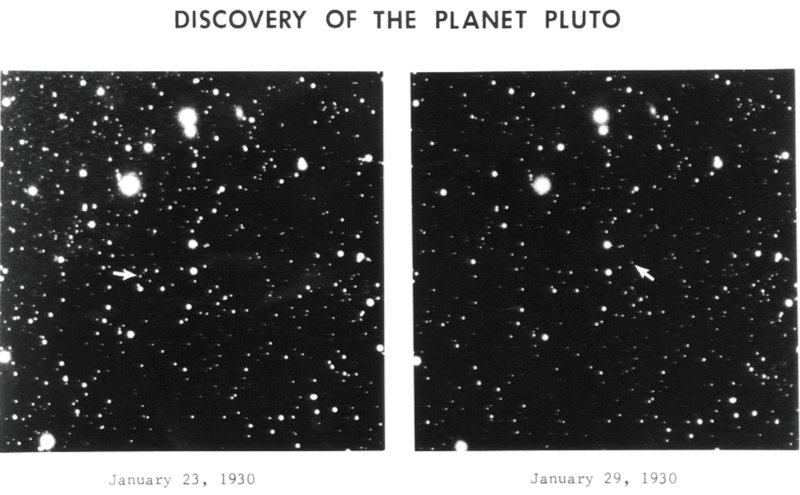 The name “Pluto” was suggested by Venetia Burney, a young girl from Oxford, England, and it was quickly adopted by the Lowell Observatory astronomers. Not much else could be said about the object, though, except some speculation about its size. Pluto orbits the sun between 29.7 and 49.3 Astronomical Units (the average distance between the Earth and the sun—149 million kilometers) away. That’s between 4.44 and 7.38 billion kilometers (2.76 and 4.58 billion miles.) Pluto for a brief part of its orbit comes closer to the Sun than Neptune; it was closer than Neptune between 1979 and 1999. The distance varies so greatly because Pluto’s orbit is highly elliptical. The orbit is also inclined at 17.14 degrees to the ecliptic plane from which the other planets deviate at most a few degrees. Pluto takes 248 Earth-years to complete just one orbit around the sun. In other words, Pluto has moved about a third of the way along its orbit since its discovery 85 years ago. Pluto is now known to be smaller than our Moon, about 2,400 kilometers (1491 miles) in diameter. A day on Pluto lasts 6.39 Earth days. Pluto is believed to be made of about 70% rock and 30% ice. Water, nitrogen, methane, and carbon monoxide ice have been detected on its surface. It has a very thin atmosphere made up of nitrogen, methane, and carbon monoxide. This is planetary science: the accumulation and analysis of better and better data by better and better technologies, until distant lights become detailed worlds. On June 22, 1978, James Christy, an astronomer from the United States Naval Observatory, noticed a bulge on Pluto scene in a photograph taken by a telescope at the United States Naval Observatory Flagstaff Station near Flagstaff, Arizona. Additional photographs and observations confirmed the bulge to be a moon. Given the name Charon, the moon turned out to be a significant fraction of the size of Pluto, so massive in fact that the two objects orbit each other around a center point in the space between them. 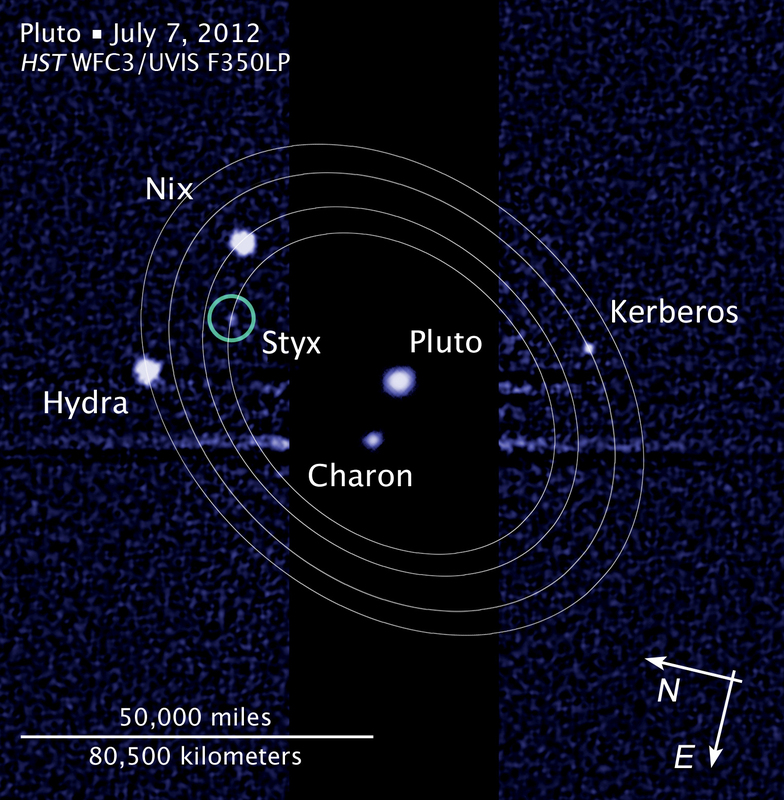 Two more much smaller moons—Nix and Hydra—were discovered by the members of the Hubble Space Telescope Pluto Companion Search Team in June 2005 and independently by other astronomers in June and August 2005. 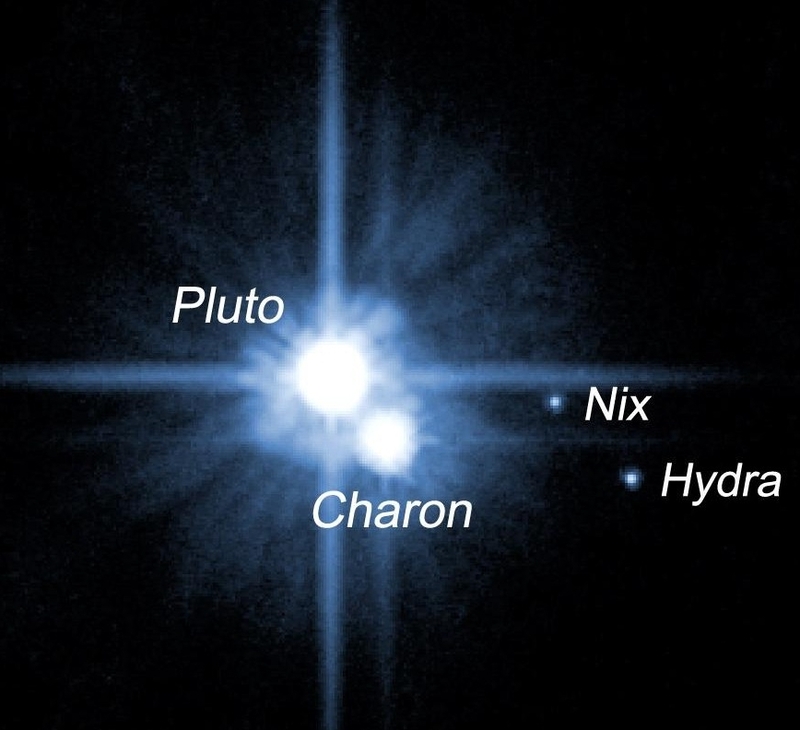 A fourth Pluto satellite named Kerberos was discovered on June 28, 2011 by the Hubble Space Telescope Pluto Companion Search Team. Finally, a fifth satellite named Styx was discovered in images taken by the Hubble Space Telescope between June 26 and July 9, 2012. But what do Pluto and its moons actually look like? From our great distance away from Pluto here on Earth, astronomers have been able to detect the color and color variations of some of these bodies. Pluto is bright and reddish. Charon appears to be quite dark. Hydra and Nix may also be dark. In March 7, 1996 the first direct images of Pluto’s surface, taken by the Hubble Space Telescope, were released to the public. These images showed light and dark patterns on Pluto’s surface. 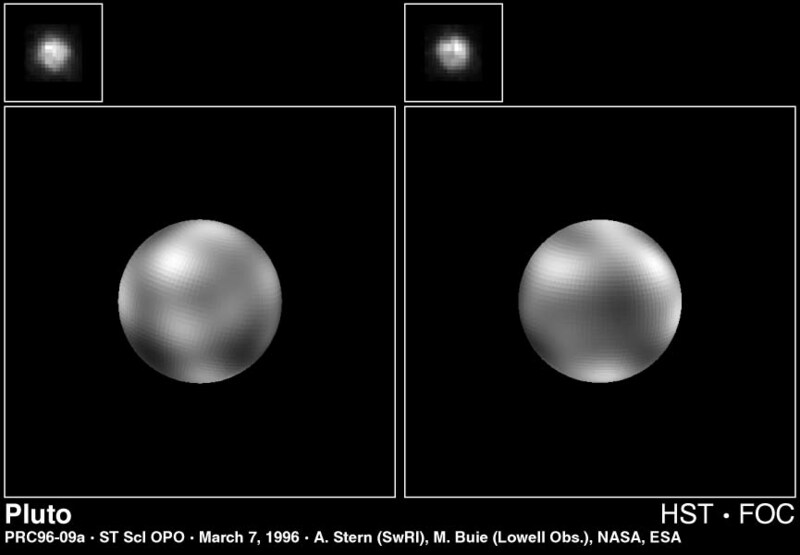 A few years later, Hubble images of Pluto released on February 4, 2010 revealed surface changes. New Horizons is a fast-traveling spacecraft launched on January 19, 2006. 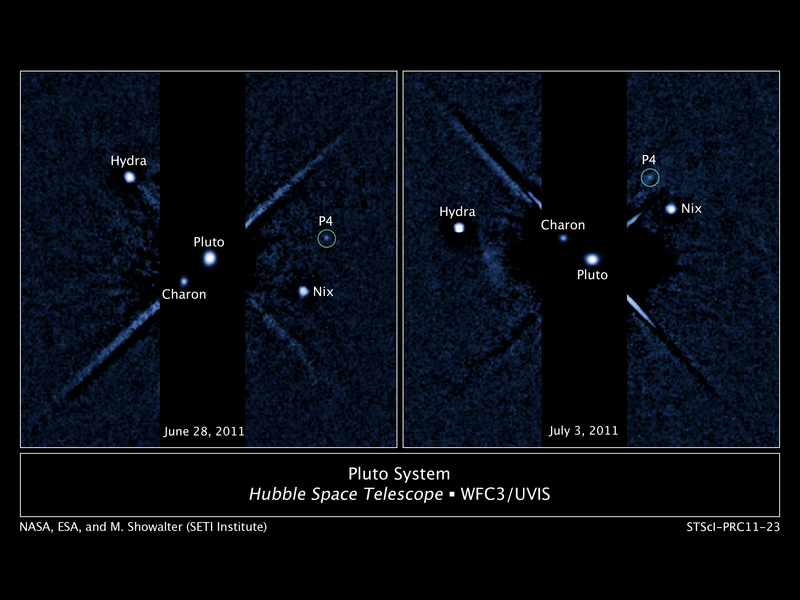 On July 14, 2015 it will speed through the Plutonian system capturing images and other data. During its approach, New Horizons has already acquired the better ever images of Pluto and Charon. In my next post, we’ll take a look at some of these.